The relationships grid is first and foremost the screen from which all the relationships can be seen and navigated to. This is a guide to getting the most out of the tools on this screen. Dashboard: The Delivery To Promise Dashboard allows you to compare deposits that have been promised to accounts that were delivered. All: The All filter will show all Relationships in the Region dictated by the Filter Bar, regardless of Status. Open: The Open filter will show all Relationships in the Region dictated by the Filter Bar, that have an open opportunity associated with them. Maturing: The Maturing filter will show all Relationships in the Region dictated by the Filter Bar, that have a loan account maturing in the next 90 days. 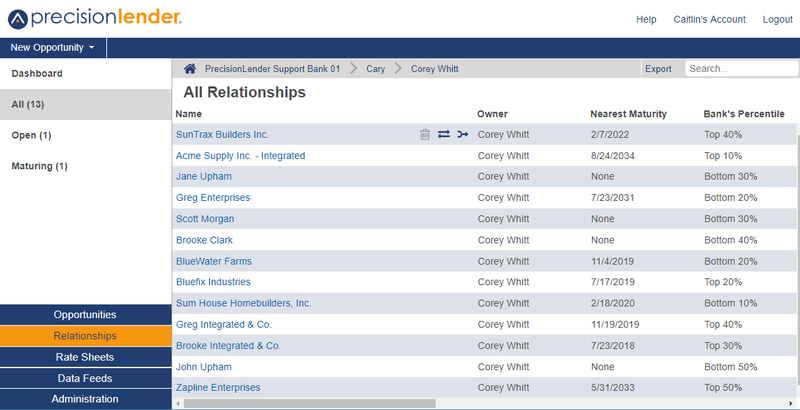 Filter Bar: The filter bar is the grey bar above the Relationship grid. It displays the current scope of the relationships contained by the grid. This can be at the owner level, the region level, or the bank level. In the image at the top of this article, the grid is displaying only the relationships that belong to the owner. The bar will collapse when there is a long regional hierarchy, long region name, or the browser window is too small to display the full path. Three dots will appear when a region name cannot be fully displayed and you may hover over the three dots to see the region name or click on the three dots to display that region. Export Button: Clicking the Export button will open a file dialog, prompting you for a location to save an xml representation of the current scope of the relationship grid. Search Field: Entering text into the search field hides all relationships that don't have the entered text in their name or their owner. For more information on the search field, see Searching within PrecisionLender. Each column header, below 'All Relationships', can be clicked to sort the grid by the values in that column, either ascending or descending alphanumerically. Relationship Name: Clicking the relationship name will open the relationship for viewing/editing. You cannot delete any relationship that has an active core account associated with it. The trashcan icon will only show up for relationships that can be deleted. The arrow icon starts the transfer process for the relationship. Upon clicking the icon, a popup will appear with a dropdown of all possible recipients of the transfer. Select the new owner for the relationship. Click the "Transfer" button to set that person as the new owner of the relationship.